These light weight models are great for small to medium surf. Features include: double swivel stand-off design, .220 diameter cord, 11/2-inch hook & loop single-wrap strap, detachable railsaver, key pocket. For surfboards size 6'8 and smaller! 6-foot length. Choose color below. The core leash is strong and looks cool! The core regular is designed for medium to large surf or longer boards (choose the core complite for small to medium sized waves). 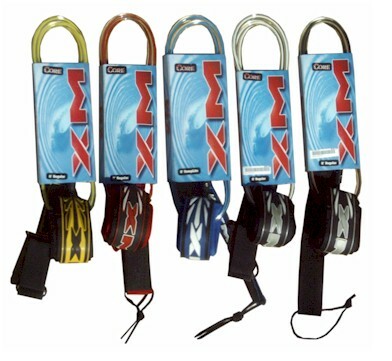 Features include .270 diameter cord, 2-inch hook & loop single-wrap strap, and detachable railsaver. Available in 6' or 8' lengths. Choose color and length below. 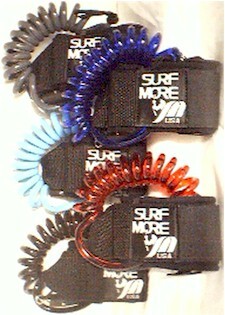 With the Surfmore XM 10' Power Clip Coil SUP Leash, you get a surf leash that truly meets your needs. The padded calf or ankle strap means you won't be stepping on your leash every time you move your feet and the heavy-duty coil prevents your leash from dragging in the water behind you, slowing you down, making you paddle even harder. 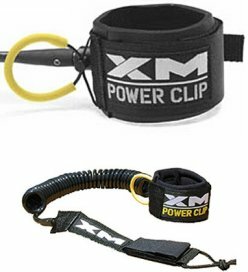 Surfmore XM's Power Clip offers both the security and convenience of a quick release. Pulled taut, this leash is 10' long but only 2' long end to end when relaxed. the Surf More XM CABO leash is a solid, no-frills leash for everyday surfing. It combines deluxe features, such as molded ends, at a very inexpensive price!